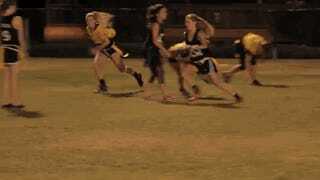 The world of Florida State flag football was turned upside-down by Delta Gamma’s Michelle Roque last year, and the sorority sister came back for more this season. Roque’s 2015 montage has dazzling jukes, impressive scrambling abilities, and a few other miscellaneous highlights. Does it also feature a generic beat for the soundtrack? Oh, you know it does. Chip Kelly, pay attention. Think of how many stupid sweeps you could run with Michelle at QB.